Mental health problems impact millions of lives. They can fracture families, hinder careers and even wreck businesses. As indicators show mental health is deteriorating across the UK, is it time to admit that everything isn’t ‘fine’? Statistically, 1 in 4 adults will experience a mental health problem each year. The most common mental health problems, such as anxiety and depression, now affect 1 in 6 people in any given week in the UK. Since the 1960s the average age of onset for depression has dropped alarmingly, down from 45 to just 14 years old. It is clear the costs of ill mental health are mounting, for both individual’s quality of life and the UK economy as a whole. According to NHS Digital, women are more likely than men to have a common mental health problem. And almost twice as likely to be diagnosed with anxiety disorders. Women in full-time employment are nearly twice as likely to have a common mental health problem as full-time employed men (19.8% vs 10.9%). Suicide and self-harm are strongly linked with mental distress, and statistics here are also shocking. Suicide is currently the biggest killer of men under 49. While self-harm numbers place the UK at the top of any country in Europe. Mental health problems often start in childhood. But ever more children are being diagnosed at ever earlier ages. 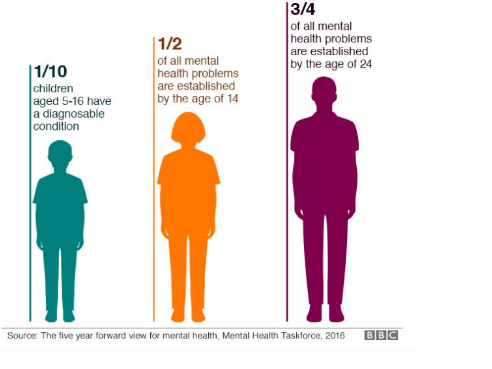 Currently, 1 in 10 child under 16 has a diagnosable condition and three-quarters of mental problems are established by the age of 24. Going even further, the YouGov survey for the Prince’s Trust states an alarming 18% of young people aged 16-25 in the UK do not think their life is worth living. This adds even more stress on working families and parents. With the demands of modern life, long working hours and financial uncertainty, families often miss out on crucial family time as traditional support structures crumble. Mental Health Organisation reports that approximately 68% of women and 57% of men with mental health problems are parents. Studies confirm that working conditions and environment can impact someone’s mental health and their performance at work. So, despite “I’m fine” being the nation’s favourite catchphrase, every week almost 1 in 6 people experience mental health problems whilst in employment. It isn’t just the individuals who suffer. Work-related mental ill health costs the UK economy up to £26 billion every year through lost working days, staff turnover and lower productivity. Evidence suggests that 12.7% of all sickness absence days in the UK can be attributed to mental health conditions. Under UK law, employers have a ‘duty of care’ to protect the health, safety and welfare of all employees (Health and Safety at Work Act 1984). ● assess the risks arising from hazards at work, including work-related mental health problems. The aim is to create a place your employees want to work in and where they can perform well. To protect workers health while also reducing losses to employers and the economy as a whole. However, while great in theory it’s often difficult for businesses to properly implement. Add to this the growing problem of increasing job insecurity and fear of being shamed, issues often remain unaddressed as employees fear talking through their concerns to an employer. Go beyond business financial health checks. With a growing amount of online resources and support available to both employers and staff, It’s never too late to address mental health concerns at work. And better mental health support in the workplace will not only contribute to the employees’ well-being but it can also save UK businesses up to £8 billion per year.